The Great Hanging, Long Ignored, Now Immorialized, Bud Kennedy, Star-Telegram (Tarrant County and North Texas),Saturday, Oct 27, 2007. They called it The Great Hanging. And for 145 years, Gainesville has tried to forget the largest mass lynching in American history. Now, it is remembering those 14 deaths plus 28 other men executed amid the political tension of the Civil War. A city park filled with 42 tiny crosses was dedicated Friday to remember the 1862 deaths. 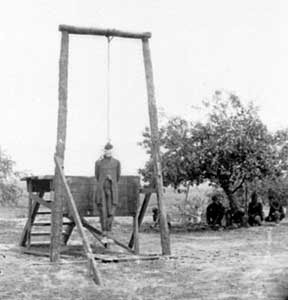 Most of the men were convicted and hanged as Union sympathizers. Fourteen were hunted down and lynched outright by a renegade mob angered by anti-war dissent. "For the first time in nearly 150 years, we are remembering the sacrifice here," said Leon Russell, 78, of Keller, a Cooke County native opposing the "cult of secrecy" around the hangings. 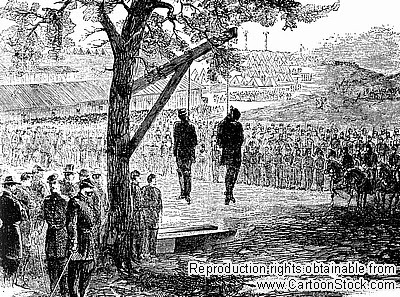 The lynchings -- and, depending on your political point of view, the trials -- are c onsidered among the most shameful abuses in the Confederate States. Yet they are rarely taught in local history lessons. "People have kept this a well-guarded secret," said Russell, a retired Dallas insurance executive, talking by phone from Gainesville's Morton Museum before the park dedication. "Some people here wanted it to stay secret." The Great Hanging has been no secret to historians. 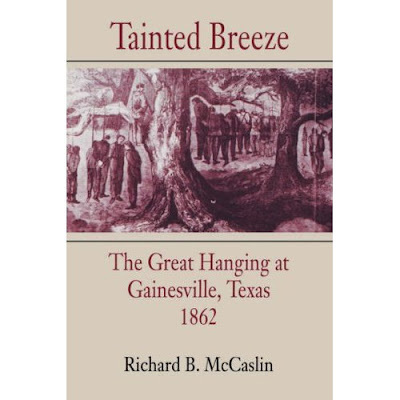 University of North Texas history professor Richard McCaslin wrote about it in a 1994 book, Tainted Breeze. McCaslin emphasized Friday that the memorial does not take either the Confederate or Union side, or blame anyone. Some local families are descendants of the 40 widows and 120 children left fatherless. One leader who lobbied for the memorial was the granddaughter of a juror. The 14 lynchings alone make it the largest vigilante-style mass killing in American history. "The only message is that this event is worth remembering," McCaslin said. Then he said something that might apply today. "In wartime, when there is so much emphasis on national unity, the very idea of free speech can be seen as threatening and divisive," he said. "The reaction can have an impact on a nation and a region." Cooke County and most of the counties north of Dallas and Fort Worth had voted against Texas joining the Confederacy. By 1862, Confederate leaders were criticized because wealthy landowners weren't getting drafted, and dissenters were organizing a Peace Party political faction. "Southerners did not agree on the war," McCaslin said. "In particular, North Texans did not agree on the war. ... All we want is for Gainesville to have a window on the past, to see that it's OK to discuss these issues even though we don't always agree." The Gainesville City Council approved the memorial Tuesday. The vote was unanimous. The Sons of Confederate Veterans, a history and heritage organization, has a chapter in nearby Lindsay. The chapter is named in part for Confederate Col. James G. Bourland, who led the arrests of those convicted and hanged. Kenneth Blair, the local SCV commander, said his group did not know about the memorial proposal. The Sons meet monthly and discuss history, but nobody has ever discussed the hangings, he said. "The facts seem unclear," he said. "Were these lawful trials, or not? Were these people spies, or was this renegade Southerners going crazy? I don't know, and I've got dear friends whose ancestors were hanged. I don't necessarily condone what happened." The idea of a memorial has been around since 1916, when a Massachusetts congressman proposed spending $100,000 for a federal monument. A Texas lawmaker opposed it, saying that some of the men were executed by a military tribunal. Russell, the man behind the memorial, said he never learned about the lynchings and hangings growing up in Woodbine, east of Gainesville. He didn't even know about the incident until a few years ago, when an acquaintance from New York asked. Russell went home to Gainesville and started asking educators and leaders. "I know it's not something for Gainesville to be proud of," he said. "But it's not something they should hide." It's not hidden anymore. CWL Reflects: It's difficult to dwell on violence that reflects badly on your region's heritage. In much of Pittsburgh's (the center of my Southwestern Pennsylvania) industrial heritage there is little talk of labor heritage and only a fraction of that is the public recognition of anti-labor violence. For a leader of a SCV chapter to say in so many words, "Well, I am generally confused about what happened" is an honest dodge, but regretable, especially with a fine scholarly work written in an accessible style, like McCaslin's, is available on the topic. It was just a broken plate found buried in a trash heap. But to researchers at James Madison's estate, Montpelier, fragments of porcelain unearthed last month from the Virginia piedmont tell a story of a first lady, two U.S. presidents, a king and queen and the revolutions that bind their legacies more than 200 years later. Discovered amid oyster shells, a chamber pot and shards of glass that filled a midden, or trash pile, near Dolley Madison's kitchen, a fractured dessert plate found by researchers during a $24 million restoration of Montpelier is believed to date to the late 1700s and might have once belonged to Marie Antoinette, the French queen with an infamous penchant for decadent living who perished at the guillotine during the French Revolution. The plate -- manufactured by the Parisian company S¿vres, which supplied the court of Louis XVI -- was part of a trove of artifacts uncovered at the Orange County estate, shedding light on the enigmatic personal life of the former president and sponsor of the Bill of Rights. Matthew Reeves, director of archaeology for the Montpelier Foundation, which is conducting the restoration, said that "100 percent of the items we're finding . . . were being used by James and Dolley Madison in their daily lives." Michael C. Quinn, executive director of the foundation, said, "We have found the mother lode." Quinn said the fact that Madison rarely wrote about himself, the scattering of his belongings after his death and a dearth of correspondence between him and his wife, who were rarely apart, have left little for historians to work with when attempting to piece together day-to-day life at Montpelier. "He never sought the limelight," said Quinn, who noted that Madison, although hailed as "the father of the Constitution" by his peers, insisted that the document was "the work of many heads and many hands." Absent a comprehensive record of household objects, the foundation has relied in part on oral histories and objects on loan from Madison family descendants, some of which have been authenticated by recent discoveries, foundation officials said. For example, the jagged S¿vres fragments, with their ornate floral pattern faded by the elements and stripped of its gold leaf, perfectly match a plate on loan to Montpelier from Madison family descendants. They say the plate is part of a set that once belonged to Marie Antoinette and that Madison bought from James Monroe in 1803. Historians believe that Monroe, who went on to become president, probably bought the S¿vres plates in Paris between 1794 and 1796, when he was minister to France. The theory is that the plates were sold to Madison to help finance Monroe's trip to France in 1803, when he went back as part of the delegation that negotiated the Louisiana Purchase for President Thomas Jefferson. "All of a sudden, that heirloom piece is given an incredible amount of validity," Reeves said, because it is now known that it was in use at the estate during Madison's life. Reeves said that further research is needed to confirm the plate belonged to the French queen but that the consistency of the find with the family's oral tradition bodes well for its prospects. The discovery elaborates on Madison's known interest in French culture, Quinn said. The French aided the United States during the Revolutionary War, and Madison hosted the Marquis de Lafayette -- who fought alongside George Washington -- at Montpelier in 1824. The placement of the midden, about 200 feet from the kitchen, and its contents help explain the way the household was organized, researchers said. Reeves said some of the plantation's 100 slaves probably collected trash and hauled it to the midden periodically. The Madisons' garbage apparently was disposed of separately from the garbage of slaves, given the exclusively high-end items the midden contained. Researchers are searching for a slave midden and hope to find it before the restoration's expected completion in September 2008, foundation spokeswoman Peggy Vaughn said. Other findings, though not as glamorous, further illuminate Madison's daily existence. A rib bone shows one cut of meat the Madisons ate. Less expensive dinnerware suggests that they saved their best china for special occasions. Remnants of champagne bottles and engraved glassware suggest that Madison had expensive tastes, which, along with stepson John Payne Todd's gambling habit, could have contributed to the debt the estate was left in after Madison's death. The debt led to the sale of many of Montpelier's items. Charred wood fragments -- probably from a fireplace used for cooking -- have been salvaged and can be screened for seeds, eggshells and fish bones to learn more about the Madisons' diet. The findings "are enormously powerful," Quinn said. "They really go directly to one of our most important missions, which is really presenting Madison's personality, his character. Soon CWL will reveal what archaeologists don't know but relic hunters do, as seen through the eyes of Bryan L. Corel and Joseph F. Balicki, two archaeologists and contributors to Huts and History. The Tarnished Thirty-Fifth Star, C. Stuart McGehee, in Virginia at War, 1861, William C. Davis and James I. Robertson, Jr., University of Kentucky, 2005, pp. 149-158. "I should show those traitors at Richmond . 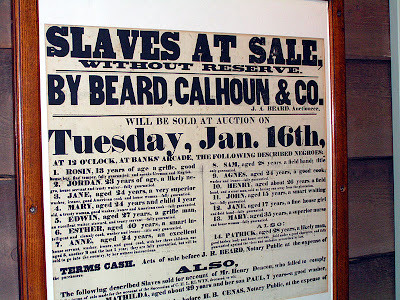 . . that we are not to be transferred like the cattle on the hills or the slaves on their plantations, without our knowledge and consent," wrote a delegate from Ohio County, Virginia upon hearing of the April 1861 secession ordinance. Because of sentiments like this one and due to the fact the Baltimore and Ohio Railroad passed through the northern counties of Virginia, 20,000 Union troops were rushed into the region immediately after the ordinance passed in a May plebiscite. In the summer skirmishes of Philippi, Rich Mountain and Carnifex Ferry Union troops roughly handled Confederate forces. Within two years, this region would repudiate Virginia secession ordinace and choose to remain in the Union. 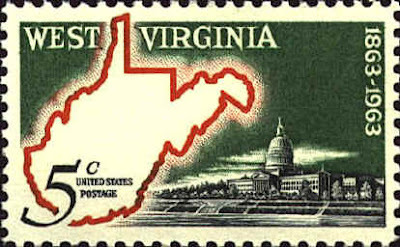 The Mountain State was offically recognized on June 20, 1863 in a ceremony at Wheeling, which lies about 20 miles from Pennsylvania to the east and the width of the Ohio River from Ohio on the west. Voters who had cast their ballots for Breckinridge in the 1860 presidential election, were soon to be voting in the 1864 election. The completion of the state's constitution in February 1862 provided for a govenor with a two-year term, established the position of lieutenant governor, withdrew the powers of county courts and gave them to newly formed townships, established an appellate court system, switched to paper ballots from voice ballots in all elections, created three new counties, made Wheeling the state capital, institution a state wide system of education with support for teacher training colleges (normal schools), put a university in Morgantown and a state prison in Moundsville and exluded negroes from the state. The U.S. Congress sent the document back to the assembly, the exclusion clause was removed and the document sent back to the U.S. Congress, which then accepted it. The likely first governor of West Virginia dropped out of the race, when the negroe exclusion clause was removed. 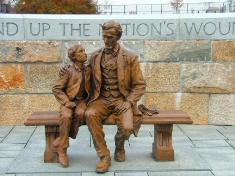 In Washington, D. C. Lincoln and his party relished the forthcoming Republican delegation which Democrats reviewed what the Constitution said about no state being created from a that was already in the Union. Lincoln signed the bill that admitted the new state of West Virginia on December 31, 1862 not quite 24 hours before the Emancipation Proclamation was signed on January 1, 1863. Fifty counties of the Old Dominion, a number greater than the new state's founders imagined, came into the Union. West Virginia's membership in the Union was a mixed blessing for the Republican Party. The citizens of the state were primarily Democrats and validated their memberships in the party in the next several national elections. By 1870, the founders were out of office. The history of West Virginia, as it was written in the first 125 years, did not speak of the intense political animosities between the Republican founders and the Democratic voters. State history as taught in the Mountaineer school books often deflected, disguised or hid elements of the intense political, social and economic struggles of West Virginia families. The school books attempted to generate pride for a state whose national reputation included stereotypes of hillbillies and mountain dew. The books reported that the creation of West Virginia in 1862-1863 was a product of genuine loyalty to the Union, a devotion to democracy, and the nation as a whole. C. Stuart McGehee, the essay's author, states that "history is not an instrument of patriotic sympathy; it is the effort to study the past to undestand the rpesent and learn lesons that may help prepare for a brighter future." 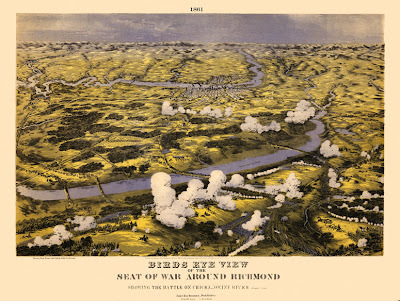 Richmond Becomes the Capital, William C. Davis, in Virginia at War, 1861, William C. Davis and James I. Robertson, editors, University of Kentucky, 2005, pp. 113-130. On February 4, 1861, acting upon a invitation from South Carolina, the seceding states met at Montgomery, Alabama. Six states attended and within a week created a provisional constitution and chose Jefferson Davis as provisional president. Politicians and newspaper editors speculated for the next sixty days on the secession of Virginia, Maryland and Kentucky. If Maryland and Virginia removed themselves from the Union, then would Washington, D.C. become the capital of the confederated states? The day after the first day of the confederation convention, February 5, a South Carolinian wrote to a Virginia senator that if Virginia secedes then the state will "have all things exactly as she wants them, including the capital." On April 17, was President Davis and Vice President Stephens were meeting, they were interrupted by the news that Virginia had seceded; basing his opinion on this news Davis told Stephens that the war was over before it had begun (pp. 115-117). The Virginia secession convention did not readily endorse the resolution. A southwestern delegate attempted to have the resolution tabled. Another southwestern delegate declared it unseemly that Virginia would rush from secession, into the Confederacy and become its capital; it appeared to be a rush for political spoils and sullied the reputation and honor of the delegates. Other delegates spoke in favor of the resolution. Hadn't Stephens offered, in so many words, the capital to Virginia? Didn't Virginia need the resources of the Confederacy to withstand the expected military assaults that would soon come? Alabama secessionists did not want to give up the capital and told Davis that he was elected the president of the Confederacy and not of Virginia. Georgian secessionists viewed Virginian secessionists as coming late to the party and bringing a lot of make-peace moderates to the government. The treaty between Virginia and the provisional Confederate Congress was ratified on May 6 and the next day Virginia was admitted to the Confederate States of America. Virginia's Governor Letcher had the reputation, among provisional Confederate congressman, as being an obstructionist and a drunk. In May, the new Confederate Virginia senators and representatives arrived in Montgomery and joined Davis, Stephens and their cabinet in lobbying for the removal of the government offices to Richmond. On May 11, a resolution was placed before the Confederate congress to adjourned on May 23 and reconvene on July 20 in Richmond, or wherever else provisional president designated. This resolution passed May 13; the resolution was sent to the Judiciary Committee which passed it on May 15 and placed it on Davis' desk for a signature. A debate continued as Arkansas seceded from the Union and sent delegates to Montgomery. A vote came on May 20. Arkansas, Georgia, Texas and Virginia voted in favor of removing the government to Richmond; Alabama, Florida, Mississippi, and South Carolina voted against it. Louisiana's delegation split on the issue. Congress adjourned at 2:00pm and set a time in the evening to reconvene. Many delegates began to travel to Atlanta for trains to their home states. That evening with the absence of two of the three Florida delegates, and a one vote change from Louisiana and second vote was taken and the resolution passed 6 states to 3 states with the actual count of the delegates 24 to 20. By the thinnest of margins the Confederate capital was moved from Alabama to Virginia on May 20th 1861. Jefferson Davis was on a train heading north on May 26 and arrived in Richmond on May 29. The Slave Ship, A Human History, Marcus Rediker, Viking Press, 434 pp., hardcover. 36 b/w illustrations, 7 maps, index, end notes, 2007. $27.95. Rediker, a professor at the University of Pittsburgh, has written previously about the Atlantic pirates, laborers on Atlantic maritime trade in the colonial through early national period, and authored Who Built America? Working People and the Nation's Economy, Politics Culture and Society: Volume 1. Human labor in the early and middle periods of U.S. history is his field of speciality. A master of the telling anecdote, he has no obvious ideological axe to grind other than to tell story of laborers, the good ones, the bad ones and the ugly ones. My goal is to read it by the last week of December. The Oxford Dictionary of Civil War Quotations John D. Wright, ed. 2006, pp. 19-20. 1.) "But General, how long will that last?" 2.) "A sage once told me General, "Plan your work and work your plan." 3.) "But General, the bayonets are closer than our friends!" 4.) "General, was that 'a cautious audacity' or 'an audacious caution' ? David Forsmark on Andrew Furguson's Land of Lincoln,FrontPageMagazine.com, 9/12/2007. Land of Lincoln: Adventures in Abe's America, Andrew Ferguson, Atlantic Press, $24.OO, 279 pp. Want to start an argument in an online political forum? 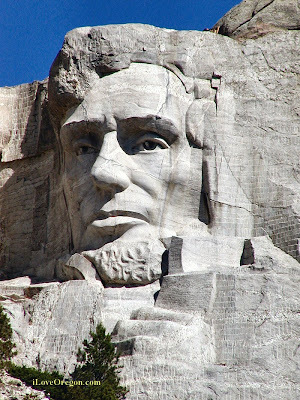 Say something nice about Abraham Lincoln. If you buy the media line that our current political climate is the most divisive in American history, you'll get an eye-opener (though the cruel fact that the Cvil War left 600,000 dead Americans should have been enough of a clue). Although beloved by most of his countrymen and universally hailed as one of the nation's greatest presidents, Lincoln remains at the core of an underground controversy. Try to imagine 140 years from now people conducting anti-George W. Bush seminars and claiming that Karl Rove was a dastardly pioneer who crossed new frontiers in the art of dividing the country. "As Weekly Standard editor Andrew Ferguson points out in Land of Lincoln: Adventures in Abe's America: "While he was alive, Abraham Lincoln was one of the most intensely hated figures the country has ever known. The minute he got shot, however, things began looking up for him." But not everyone thinks Abraham Lincoln is No. 1 — with or without a bullet; and the debate rages well into its second century. Just when you think it's impossible for anyone to say anything new about Lincoln, Ferguson's Land of Lincoln is an invigorating and refreshing addition to the canon. Equal parts travelogue, history lesson and sociology text (of the P.J. O'Rourke school), Land of Lincoln is relentlessly fascinating, frequently hilarious, and unexpectedly poignant. In short, it is one of the season's best surprises. Born in Illinois, Ferguson grew up a natural-born Abe-ophile. As an editor for The Weekly Standard, he was hardly isolated from arguments among conservatives over history, political correctness and the history of Big Government. 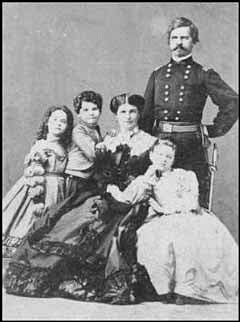 With his generals he invented the concept of Total War, and waged campaigns of unprecedented savagery against noncombatants and private property in the Shenandoah Valley, Sherman's March through Georgia, and elsewhere. He was the father of Big Government, vastly expanding the reach of imperial Washington in ways unthinkable to the country's founders. The Northern victory was, therefore, the triumph of a cosmopolitan, commercial culture run by Big Business, over a Southern culture of small towns and farms that only asked to be let alone." Whatever one might think of Bowling's grievances, they are at the least informed by history and worth arguing over. Ferguson was less impressed by the pro-Lincoln forces, a befuddled group of chamber-of-commerce types who were shocked to find anyone still harbored a grudge against St. Abraham. They did nothing to pacify their opponents by inviting only leftist historians to man the panel discussion over Lincoln's greatness. In Ferguson's mind, they made the great war leader sound "like Bill Moyers." Robert Kline, the man who established the dubious United States Historical Society to promote the Richmond statue (and sell knickknacks), gushed to Ferguson that any extra money generated by the project it would go to the Richmond Peace Center -- "a wonderful group" -- where signs are posted that say "Jail Bush, Not Saddam." "They stand for a lot of the things that Lincoln stood for," Kline enthused to a bemused Ferguson, "Peace. Understanding. Their specialty is conflict resolution." Somehow, the fact that Lincoln stubbornly presided over the nation's most brutal war in the face of public discontent had become a footnote to a "historical society" in the heart of the Confederacy. Ferguson attends a "Lincoln Reconsidered" seminar featuring Dr. Thomas Dilorenzo, author of The Real Lincoln, which capitalized on the controversy to boost attendance. Ferguson once again is dismayed to learn the people in attendance are closer to him politically than the Lincoln fans. Skipping the lunch at the seminar, Ferguson wanders around downtown Richmond and happens upon a teachers -- excuse me, "educators" -- conference on "Early Education," where the seminars boast such titles as "Banning Superhero Play." When he tells the educators why he;s in town, their eyes glaze over, and they mouth platitudes like, "History can be a good learning experience." Ferguson looks around the room full of warm fuzzy political correctness and realizes of the anti-Lincoln crowd, "Those guys say they don't like Lincoln, and they don't; but this is what they really hate, this right here. The country turned into something they don't like, and they think Lincoln's responsible, and they will never forgive him for it." As Ferguson notes, from the moment of his death, Lincoln has been dragooned into causes ranging from national temperance to the Communist Party USA, which named its volunteers unit fighting in the Spanish Civil War the Abraham Lincoln Brigade. Churches got in the act, too, despite the fact that while Lincoln liked to quote the Bible, he never joined a church and had a very ambiguous spiritual life. 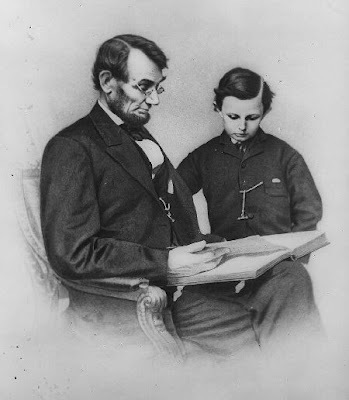 From the barely religious Unitarians to Evangelicals using Lincoln's life and death as a parallel to the story of Jesus to Mary Baker Eddy's claiming the martyred president for Christian Science, Lincoln lived on in American pulpits. The Richmond experience leaves Ferguson determined to find the real Lincoln. "What threw me…was the vehemence of the people who hated him, and — just as surprising -- the mildness of those of those who would defend him. (The scholars) came up with one of two Lincolns: a racist, warmongering totalitarian, or a sentimental old poop — Mussolini on one hand, or Mr. Rogers on the other." So, Ferguson sets off on a journey to visit sites, seminars and individuals devoted to Lincoln, sometimes (and hilariously) with a reluctant family in tow. He visits collectors of Lincoln memorabilia, who have varied backgrounds and political outlooks but share one thing: a hem-of-his garment depth of reverence for things touched by the great man. Handwritten copies of the Gettysburg Address top the list, of course, but there also is a huge market for items related with Ford's Theatre and Lincoln's funeral. One man Ferguson meets claims to have a fragment of Lincoln's brain matter scattered by Booth's bullet. The shrines range from an impressive Disney-designed memorial extravaganza in Springfield, Ill., (where one of the designers takes pride in the fact the museum section contains no guns) to a statue build by a Thai immigrant restaurant owner in an Arab neighborhood who thinks Lincoln typifies all he loves about America —and is convinced the president's first name means he was Jewish. Ferguson finds Lincoln is also an inspirational icon for many folks who would probably buy WWLD bracelets if someone were to market them. He attends a convention of Lincoln impersonators who consider their craft a calling, not a hobby. This culminates with a laugh-out-loud sequence where a few hapless tourists stumble upon the gathering of Abes who are overly eager to perform. Honest Abe also has been the inspiration for many self-help books, including the grandaddy of them all, Dale Carnegie's How to Win Friends and Influence People. Most people forget Carnegie's first book was a blarney-filled biography of Lincoln, Lincoln the Unknown, and how prominently Abe figures in Carnegie's anecdotes in his most famous work. Lincoln also figures prominently as a modern business guru, a role that, at first glance, might be an awkward fit at best, Ferguson writes. As he notes, The Seven Habits of Highly Effective People "do not include 'Forget to cash your paychecks,' and 'Keep your most important stuff in your hat.'" When Ferguson attends a business seminar that looks for the secret of management success in Lincoln, he finds the business gurus — and the bestselling business management book Lincoln on Leadership — are at least far closer to the reality of Lincoln as a person than those who once celebrated Lincoln/Lenin Day. While the "War of Northern Aggression" has certainly won the day in academia, no doubt fueling the siege mentality of many at the Lincoln Reconsidered conferences, some balance seems to be returning to popular historical writing. Such historians as Jay Winik and Thomas Fleming, along with father-and-son "novelists" Michael and Jeff Shaara, prove it is possible to love Lincoln and Robert E. Lee. Some 14,000 books have been written about Abraham Lincoln, but Ferguson's Land of Lincoln is remarkable enough to stand out in the crowd. It's hard to imagine another book will ever explore the love/hate affair of Lincoln and the nation in such an entertaining and insightful way. CWL's Thoughts: A personal favorite of mine is Tony Horowitz's Confederates In The Attic in which Horowitz tours and describes Dixie in a manner that reveals the humanity of those who dwell upon differnt aspects of the Confederacy and its culture. Both reverantly and irreverantly, Horowitz draws sharp pictures of, not the past, but of the present and how memory can be manufactured. Every generation uses the past to interpret its present. Hopefully, Ferguson has done for Lincoln what Horowitz did for Dixie. News---Appomattox, The Opera: Is it over when the fat generals sing? World Premier of Work by Philip Glass is a Sure-Fire American Classic, Seán Martinfield, Fine Arts Critic, San Francisco Sentinel, October 14, 2007. APPOMATTOX is the perfect American Opera. Its story of the surrender of the Confederacy to the Union Army is a cornerstone of American history and an artery of the human experience. The look and feel of our Civil War – its imagery, poetry, politics, rhetoric and music – hovers bright and clear in the currency of campaign speeches, street marches, Supreme Court arguments, week-end sermons, sports and entertainment commentary, sometimes whipping in the breeze from an available flagpole. Composer Philip Glass has produced an amazingly persuasive vocal score that sits comfortably in the operatic column – inviting and compelling to all. The musical structures and vocal lines are all at once familiar in the ear, strident in the heart, close and intimate in the collective memory. APPOMATTOX, the Opera is a series of iconic tableaux. Mr. Glass has teamed with librettist Christopher Hampton (Oscar Winner, DANGEROUS LIAISONS; Tony Winner, SUNSET BOULEVARD) to create both psychic tension for unseen battles and reports of thousands of soldiers suddenly slaughtered to the disturbing on-stage realities of dead horses strung-up for food and a child shot during an evacuation. A scene with blood-red lighting by designer Christopher Akerlind evokes the horror of blood-soaked earth, another approaching dawn – and memories of the famous crossroads scene in “Gone With The Wind”. Likewise, fashions created by Gabriel Berry are as rich and smooth as those of MGM period designer Walter Plunkett. CWL Reflects: I saw my first reenactment in the summer of 1993 in Gettysburg and I saw the film Gettysburg about six times in the course of six months during 1993 and 1994. I became a Civil War reenactor in late 1993. Will the next generation of CW reenactors say, "I saw Philip Glass' Appomattox and after that I started wearing wool in July" ? News---New Jackson Film : "How I Loved My Slaves and They Loved Me"? Still Standing: The Stonewall Jackson Story, Ken Carpenter, Director and Producer, Franklin Springs Family Media, October 2007. Following copy is from Turning Point Media Relations, Inc., provided by Christian Newswire, October 7, 2007. "Still Standing: The Stonewall Jackson Story" is a revealing 48-minute documentary recounting the life and faith of Civil War General Thomas J. "Stonewall" Jackson and will be available this October from Franklin Springs Family Media. Produced and directed by award-winning filmmaker Ken Carpenter, the film is based on the book "Stonewall Jackson: The Black Man's Friend" (Cumberland House Publishing, 2006). The inspirational book is authored by Richard G. Williams Jr. Williams, who also happens to be the film's co-producer and historical consultant. Through state-of-the-art imagery and expert narrative, "Still Standing" traces the life of Stonewall Jackson, from his orphaned childhood in what is now West Virginia; to the pivotal role he played as Confederate general in the Civil War; to his death at the age of 39 after being killed by friendly fire. The film features striking new footage from Jackson's boyhood home near Weston, W.Va. and a special look at Jackson's Sunday school classes for African-Americans as well as key Civil War battle sites including Manassas, Chancellorsville, Harpers Ferry and others. "Richard Williams's book about Jackson's caring efforts to advance the standing of enslaved people reveals a fascinating side of this great American hero—a side we never learned about in history class. The film explores the character that defined this man and I believe it will inspire and challenge audiences to reconsider preconceived notions about a uniquely complex period in American history." Williams is an award-winning author specializing in Civil War history. A regular contributor to the Washington Times Civil War column, Williams contributes articles about the war to various publications around the country. "Still Standing" will be Williams' second documentary project. Past projects include co-producing the award-winning video series, "Institute on the Constitution" with constitutional attorney John Eidsmoe. Williams currently serves on the Board of Trustees for the National Civil War Chaplain's Research Center & Museum Foundation at Liberty University in Lynchburg, VA. His passion for America's Christian history has led him to author three books: "Christian Business Legends", "The Maxims of Robert E. Lee for Young Gentlemen", and most especially "Stonewall Jackson ~ The Black Man's Friend." Please visit his website at SouthRiverBooks.com. For Further Information regarding the documentary, resource FranklinSprings.com or contact Turning Point Media Relations, Inc. at 615-261-1818. 1. The book and film are the spawn of two scenes in the film Gods and Generals. 2. The curious should check the index of James I. Robertson's Stonewall, The Man, the Soldier and the Legend. 3. Can the complexity of the slave and master relationship in mid-19th century America be adequately and accurately addressed in a 45 minute film? I doubt it. Museums for a key battle of the American Civil War as well as World War I have had an influence on a new battlefield centre at Culloden. The National Trust for Scotland (NTS) is constructing an £8m interpretation centre at the site near Inverness. Trust staff visited In Flanders Field in Belgium and Gettysburg National Military Park in America. They looked at what worked well and any lessons that could be learned from how exhibits and information was displayed. Colin MacConnachie, NTS head of education, revealed the site visits in the latest edition of a magazine for members. The effort was supported by Scottish Heritage USA and National Trust for Scotland Foundation USA. The Battle of Gettysburg during the Civil War had 51,000 casualties. CWL wonders: Cullodon, Gettysburg, and Flanders. I don't think I've ever seen those names in the same sentence before. Battle Rages Over Neutra’s Cyclorama Center, Ted Smalley Bowen, Architecural Record Online, October 3, 2007. The Battle of Gettysburg lasted three days. The battle over the fate of Richard Neutra and Robert Alexander’s Cyclorama Center at the Gettysburg National Military Park has dragged on for 10 years—and now, with the park poised to raze the building, it has shifted to the federal courts. Richard Neutra’s Cyclorama Center at Gettysburg could be gone by 2009. Opened as a visitor center in 1961, the Cyclorama Center was built as part of the Park Service’s Mission 66 program, which erected roughly 100 Modernist visitor centers and hundreds of other tourist buildings between 1956 and 1966. It housed a life-size, narrative oil painting of 1884, by French artist Paul Philippoteaux, depicting the pivotal Civil War battle. Cyclorama paintings are hung in 360-degree circular spaces. The Gettysburg painting’s 27 panels have been restored and will be moved to a new facility. The Gettysburg National Military Park’s 1999 management plan calls for the removal of the Cyclorama Center as part of the “rehabilitation of major battle action areas, where features on the landscape affected the fighting,” says spokeswoman Katie Lawhon. The park’s period of historical significance runs from 1863 to 1938, she adds, and applies to the battlefield, cemetery, and commemorative elements, including monuments and carriage roads. Dion Neutra and the Recent Past Preservation Network (RPPN) are suing officials of the Department of the Interior, the National Park Service, and the Gettysburg park in an effort to halt demolition of the Cyclorama’s old home. They allege that officials failed to heed environmental and preservation laws in deciding to raze the 30,000-square-foot building, that they neglected its upkeep, and that officials failed to consider alternative uses for it. In the meantime, the park is forging ahead on construction of a new, 139,000-square-foot museum and visitor center two thirds of a mile southeast of the Neutra building. Designed by Cooper Robertson & Partners, it is scheduled to open in April 2008. Lawhon says that within a year of its opening, the park will demolish the Cyclorama Center. The World Monuments Fund included the Cyclorama Center on its 2006 Watch List. Dion Neutra has lobbied vigorously to save it and other remaining examples of his father’s work. His efforts include a petition requesting that President Bush issue a White House pardon for the Gettysburg center—although the tactic’s symbolism is questionable. “I wouldn’t compare the building to a turkey,” says RPPN president Christine Madrid French, “but, in the sense of forgiving the building’s appearance after such neglect and moving past the bias against Modernism, it works.” The Washington, D.C., federal district court will hear the case in November, according to French. “I’m just glad my dad didn’t live to experience this,” Neutra says. “The project meant so much to him as an immigrant.” The elder Neutra practiced in his native Austria before emigrating to the United States in 1923. Architectural Preservationist says: I wouldn't compare it to a turkey and get over your bias against Modernism. The architect's son seeks a Presidential pardon for the building. Doesn't that take the commission of a felony and about a $2 million campaign contribution? The architect's son views his opponents, the NPS, as being myopic. Of course, he's not myopic about the value of a poured concrete building. CWL wants a T shirt with the demolition of The Tower on the front and the demolition of The Cyclorama building on the back. CWL---Command and Control: Longstreet Better Than Jackson? Yes. Longstreet and Jackson Compared: Corps Staff and the Exercise of Command in the Army of Northern Virginia, R.L. DiNardo in Longstreet: The Man, The Soldier, the Controversy, R.L. DiNardo and A.A. Nofi, eds, Combined Publishing, 1998, pp 165-190. Federal and Confederate staff manuals were either dated back to the Revolutionary and Early National era or non-exsistent in a practical sense. West Point taught no staff theory and the military has a whole had no staff school. The manner of selecting staff personal was unique to each commander. Jackson picked pre-war friends. Longstreet picked only two pre-war friends; early in the war, he chose men of striking intelligence who came to his attention as he rose in command. Jackson chose many of his staff from those whom he had known in Lynchburg, Virginia before the war; Pendleton, Dabney, Junkin and Smith were acquaintances from there. Hunter McGuire was from Winchester and met Jackson while treating him for a finger wound at First Manassas. Dabney, whom Jackson knew as a moral man and a preacher, left the staff after the Peninsula Campaign. The failure to submit battle reports, something he had stopped to doing after First Kernstown, drew the ire of the Confederate Congress, which pressured him to find a staff person to perform the task. Charles Faulkner, after the Sharpsburg Campaign, join Jackson's staff as amanumissus and chief of staff. Both Jed Hotchkiss, Jackson's and Lee's mapmaker, and Henry Kyd Douglas viewed the appointment as an obviously wrong choice. Faulkner's rank of Lieutenant Colonel seemed extravagent to Douglas, Pendleton, and Hotchiss; they knew Jackson was a miser when handing out laurels and shoulder boards. Pendleton was wrathy because he had served as chief of staff to Jackson since July and did not recieve the permanent recognition of the title and rank. (Longstreet and Jackson Compared, 167-170). DiNardo repudiates Hagerman's claim in The American Civil War and the Origins of Modern Warfare that numerous, efficient, and well-organized officiers and couriers were always present with the corps commander and always giving directions to the division commanders. Nothing could be further from the truth. In fact, Jackson aused his staff officers as nothing more than runners. Jackson's uncommunicativeness towards divisional a brigade commanders is well known. "For staff officers to provide tactical coordingation to Jackson's corps, Jackson would have to give them a reasonably clear idea of what his plans were," and Jackson didn't. 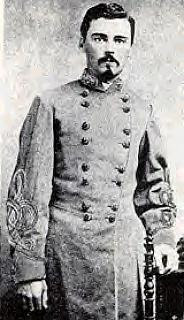 Major John Harmon, chief quartermaster of Jackson's troops, called him "crack brained" during the spring 1862 Shenandoah Campaign due to his excessive secretiveness. Douglas wrote to a friend at the end of the campaign that Jackson had not informed his staff of the sudden movement to the east towards the peninsular that spring. Testimonies abound regarding Jackson lack of communication to his staff. Dabney wrote G.R.F Henderson, a post-war Jackson biographer that Jackson only use his staff to carry messages, that orderlies and couriers were scarce at Jackson's headquarters.Dabney told Henderson that he would grab any handy cavalry detail, regardless of their knowledge of local roads and location of Jackson's divisions and brigades. Under the Second Manassas campaign, Lee personally ordered a particular detachment to serve as couriers for Jackson, a decision which may reflect Lee's confidence in Jackson's ability to stay in touch. Fredericksburg campaign provides the best example of the ignorance of Jackson's staff. 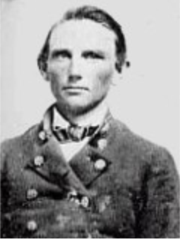 Pendleton confessed on December 5 to one of his sisters that he had no knowledge of what Jackson would do that month and did not consider any battle imminent. When Pendleton was wounded during the battle, D.S. Freeman concludes the Jackson's staff 'went out of gear' though he is not specific in which ways the staff work skidded to a halt. DiNardo asks that if Pendleton was so important then why was he ordered to run courier errands. "There is . . . no indication . . . that Jackson ever gave his staff officers any discretionary authority, with the singular exceptions of . . .' the quartermasters. (Longstreet and Jackson Compared, 170-173). There is a marked difference between how Jackson and Longstreet handled their staffs. Only two were pre-war relatives or acquaintances. Thomas Goree and Longstreet met on a train travelling from Texas to Virginia. Moxely Sorrel wandered into Longstreet's July 1861 Manassas camp and, after an introduction and conversation, volunteered as an aide-de-camp for the battle. Raphael Moses labored in Toomb's Brigade and D. R. Jones Division before Longstreet placed him on his staff. Osmun Latrobe gained staff staff in the same manner. Cordiality marked the staff of Longstreet, unlike the acrimony of Jackson's staff. Though political disagreements rose between his staffers and himself after the war, friendships remained. One reasom may have be that rank was freely given to the staff in relation to the work performed; in a side-by-side (individual/work) comparison, it appears that Longstreet's staff was one rank higher that Jackson's staff. (Longstreet and Jackson Compared, pp. 174-178). Longstreet kept his staff informed of his plans while Jackson did not. DiNardo cites several of Longstreet's order communicated commanders through his staff; these orders are marked by details regarding movement and destination along with the location of Longstreet's headquarters in order to faciliate communication from the commanders to himself. The degree of latitude in decision making Longstreet bestowed upon his staff is in stark contrast to Jackson exacting but at times vague orders. Actress Sally Field is all set to play Mary Todd Lincoln in Steven Spielberg's long-gestating biopic ‘Lincoln’. The film will be based on historian Doris Kearns Goodwin's ‘Team of Rivals: The Political Genius of Abraham Lincoln’. According to Hollywood Reporter, the movie may focus on the 16th US president's role in leading the North in the Civil War. The newspaper also reported that Liam Neeson has been signed to play Lincoln in the movie. Earlier, it was being speculated that Marcia Gay Harden could bag the character of Lincoln's wife. Tony Kushner is writing the screenplay for the DreamWorks project. Spielberg will focus his attention to ‘Lincoln’ once he completes ‘Indiana Jones and the Kingdom of the Crystal Skull’. CWL's Idle Speculation: Part 'War Room', part 'Schindlers' List' and the first half hour of 'Saving Private Ryan'. Spielberg, having produced 'Amistad', shows that he is in touch with spirit of the times.